BlackBerry Play Book updated the new platform which is comparatively tremendous experience. The new upgraded software 2.0 has several special features. 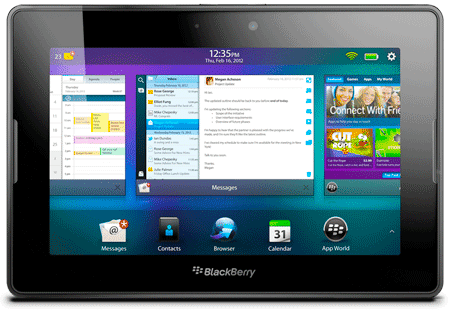 For your business needs, the BlackBerry Playbook creates a special attention throughout. For access to your business applications and productivity tools access all the ways communication from one place, now calendar, contacts and messages- applications are built into the Playbook. These features offer more information about your contacts and the people and companies on your calendar. The Research in Motion (RIM) designed more productivity into your day with playbook. It fulfill with powerful QNX technology, can edit files right from your tablet with Documents ‘To Go’. Now your Video chat is more powerful and beautiful through HD video camera plus stereo speakers. Enable real multitasking features in the Playbook and check your email while chatting with one of your contacts.